Our adventure started on Friday 27th March at 03.30 am, due to a late arrival home from work Lolly hadn’t quite got all her stuff together so was busy sorting the final things she and we would need for our trip. I’d packed all my gear up and just needed to transfer it to the newly acquired roof box which looked massive until I put it on the van. The box was adequate to get pretty much most of our gear in for the week, for 95 quid and a tenner in diesel to go pick it up, in my eyes we got a bargain, it’s a Thule Evolution 100 for those that are interested! This was our first week away in the van so what to and what not to pack is a learning curve, I will let you know my thoughts on that when we get home. By 05.30 we were on the road, the M25, which usually is a royal pain in the rear was more or less empty which made getting to the M40 a doddle. We didn’t really hit any traffic till we got to Birmingham around 08.30 and that wasn’t bad to be fair. 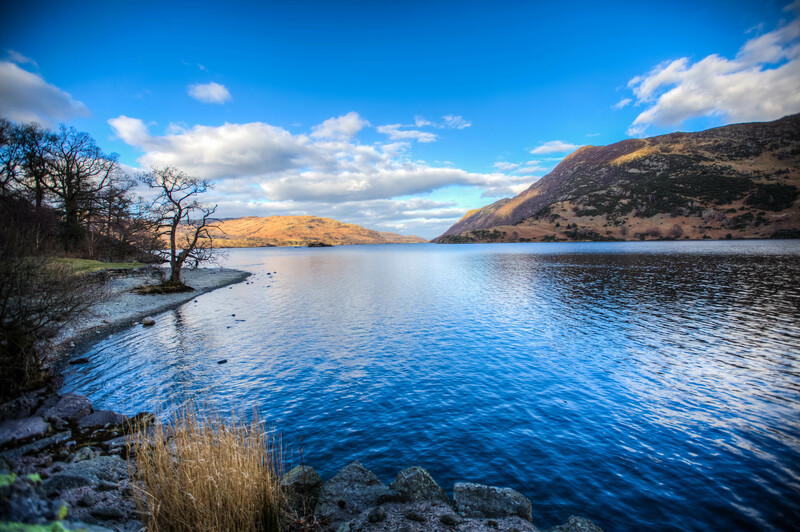 Google states that the journey time from ours, assuming you abide by all speed limits and are continually moving to The Quiet Site in Ullswater, our first port of call is around 5.5 hours. What google doesn’t take into account is Lolly and I are the masters of fannying about so we didn’t get to the campsite until about 18.30 which by my book is roughly 13 hours of travelling…. 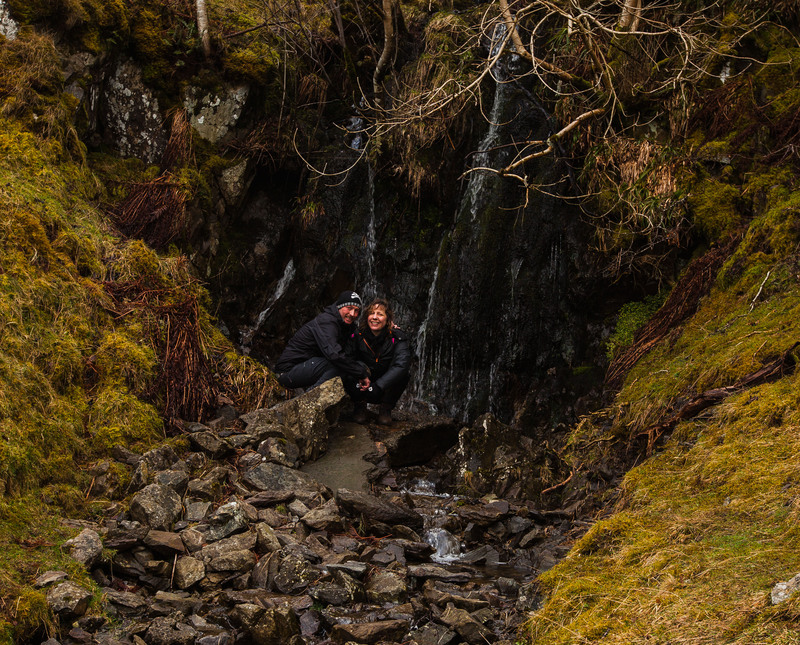 We did stop off a few times in the van for refreshments, a spot of walking gear shopping at Decathlon in Warrington, an amazing burger and impromptu cider tasting, some photo and video ops and a tramp in our recently acquired walking kit around Aria Force. If we hadn’t stopped then we would most likely of got to the campsite at around noon. We came off the M6 and followed the A590 to Windemere which is a slower but scenic route and definitely worthwhile, you end up so high there is snow on the ground still, nothing to trouble you road wise but it’s there on the hills and you get that snow-capped mountain view which is really quite beautiful. On arrival in Windemere you are immediately drawn to the water, we parked up a fair way from the lake, went for a wander with a view to finding a spot looking out over the lake for some lunch. Windemere is a tourist attraction and as such, full of tourists, coaches and cars, parking is a mission when you arrive there and in all honesty, we didn’t really see anywhere nice by the lake to have lunch and a beer so we carried on up the road. We carried on heading toward Ullswater, we’d been in the van a while and I thought we should go stretch our legs, to our left was a sign for a National Trust house so I took the left and headed off up a very steep and windy road. We didn’t find the house but we did find a lovely little village with a pub, our stomachs got the better of us and swerved in to The Mortal Man . Whilst looking at what real ales they had lolly enquired what ciders they stocked, the guy behind the bar insisted we taste each one of 5 ciders he’d drafted in, we did, they were lovely. There was also a good selection of local ales and the usual lagers and ciders. We grabbed a menu each and there were lots of nice things on there but for life of you I couldn’t tell you what they were as all I saw was burger and that’s what we each ordered. The burger came and it was like an open sandwich but with burger meat on each bun, melted cheese on one patty and salad on the other, the meat crumbled when you bit into it so it must have been hand made on site and was generously seasoned with garlic which hung about for the next few hours! The food was lovely as was the welcome, if you ever head up that way check it out, I would imagine a beer and food in the garden around summer when the sun should be shining would be fantastic! We headed off in search of our campsite but again got distracted, the sun was shining and Ullswater Lake looked stunning so we stopped off for a picture. Our home for the next three nights was a place called The Quiet Site which has fantastic views of Ullswater Lake and makes a real commitment to green camping. I highly recommend this site for a number of reasons, the staff are professional and friendly, the site itself is beautiful, has a kind of festival vibe to it without all the wreck heads, the facilities were clean and well serviced but the crown jewel of this site in my opinion is the bar. There is a little door that says games room and bar, you go through and to your left is a room that should keep most teenagers amused with air hockey and a pool table, do a right and you head into the bar which looks like it might have been there from the beginning of time, after a hard days walking about it’s most welcome to head in there and have a beer in front of the roaring fire! The bar stocks local ales including the sites very own “Quiet Pint”, local ciders and a good selection of the usual suspects you would find in most bars or pubs. The one thing they don’t do is hot food but there are plenty of bar snacks available. I meant to take a picture but in the end didn’t get time, the pic below I nabbed from the internet. We set the van up which involves plugging in an electric hook up cable and putting the thermal curtains up and took a wander to the bar, had a couple of drinks and retired to the van for an early night, there was lots to do tomorrow, the weather wasn’t too bad when we crashed. As you can see, all the other caravans are parked up nose first toward the lake as opposed to side on like us, we wanted to wake up in the morning, slide open the door and be greeted with a beautiful view of the lake. 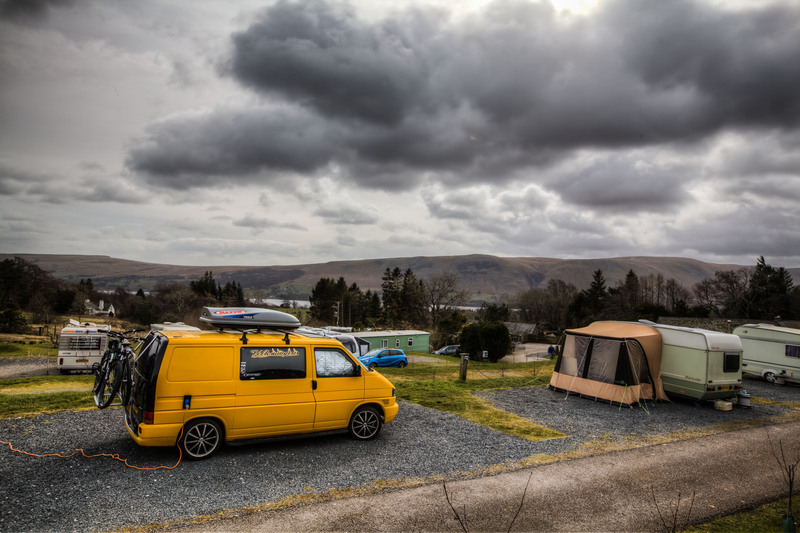 In the morning it was chucking it down so we weren’t really tempted to open the door to admire the view, instead we peeled back one of the curtains, wiped the windows, observed the dismal weather outside and made a brew in the van. 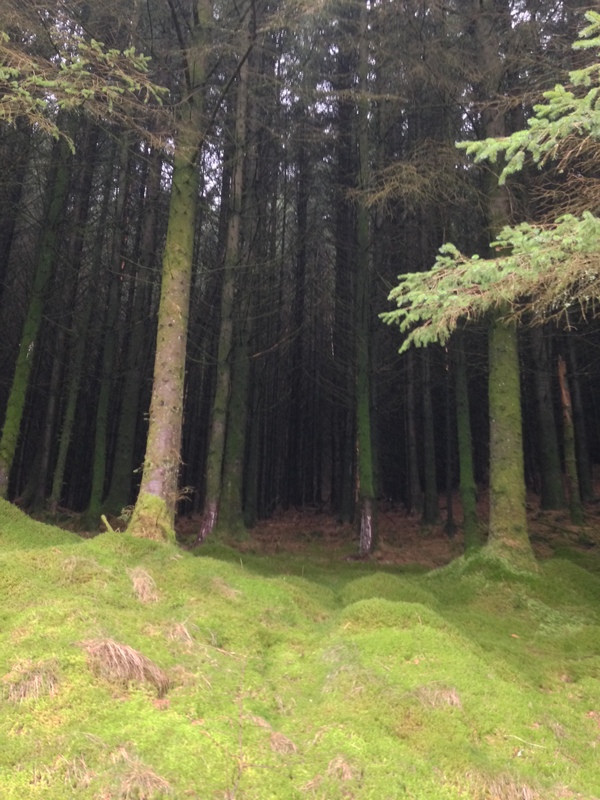 Our plan for day 2 was to head to Whinlatter and give the mountain bike trails a bash. 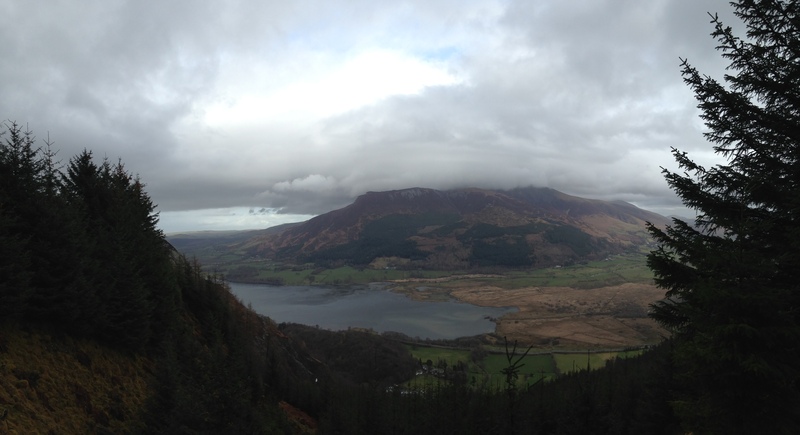 Whinlatter is home to the longest purpose-built mountain bike trails in the Lake District and there are also walks around the forest too. We had showers, faffed about for a bit and then set off. The journey to Whinlatter is about 30 mins in the van, just short of our arrival we stopped off at a view point next to the most optimistic ice cream van I have come across (it was cold, chucking it down and not ice cream weather) and Lauren made us some lunch, she’d brought along some stew which she heated up in the van with some bread we picked up, it was lovely! I off loaded the bikes, sorted out the parking and we headed for the trails, I initially insisted we do the red runs like we did at Bedgebury but these were a bit more technical and on the basis that this was only the second time Lauren had been out on her bike we baled after the first run and opted for the easier trails. After a short while we came to a bench that was slap bang opposite the ice cream van albeit on the other side of the valley with an option to go up or down, the up option had the walkers only marker so I figured our trail went down, it didn’t and we got hopelessly lost without a map either. I guess the real giveaway was when the trail became grass and a spooky looking forest on one side. Which all came to a dead end with a waterfall and river preventing any further journey forward. With nowhere to go and the prospect of having to walk back up the steep track we’d come down we sat down and admired the waterfall, that’s when we heard the voices. It seems that although this wasn’t where bikes should be, we’d ended up alongside a walking path and two chaps were out on a walk and were a bit surprised to see a couple of bikes leaning against a tree. I wandered over, said hello and explained we’d got a bit lost and didn’t have a map, no worries one of them said, we’ll get you back on track. I wasn’t too worried when the route back to a track was described as “a scare of rock that our dogs had a bit of trouble getting up” but maybe I should have been, what followed was an hours ascent up what started as a goat track and finished as a major rock climb with a mountain bike on our backs, hats off to Lolly, our bikes aren’t light and she made it all the way up to the top without a single complaint, it was hard graft and I wish I got a picture to show you the rock face we climbed up with our bikes, never again! We thanked our saviours who gave us half of the map they didn’t need so we wouldn’t get lost again, had a drink and followed the track back down to where the van was parked, Lolly wasn’t really up for going out again but I managed to convince her after a quick brew and a pork pie to boost our energy levels, second time around we followed a different trail that was better sign posted, we didn’t get lost, it was a nice ride. We headed back to the quiet site and decided on stopping at the Brackenrigg Inn for food which is close by to TQS. 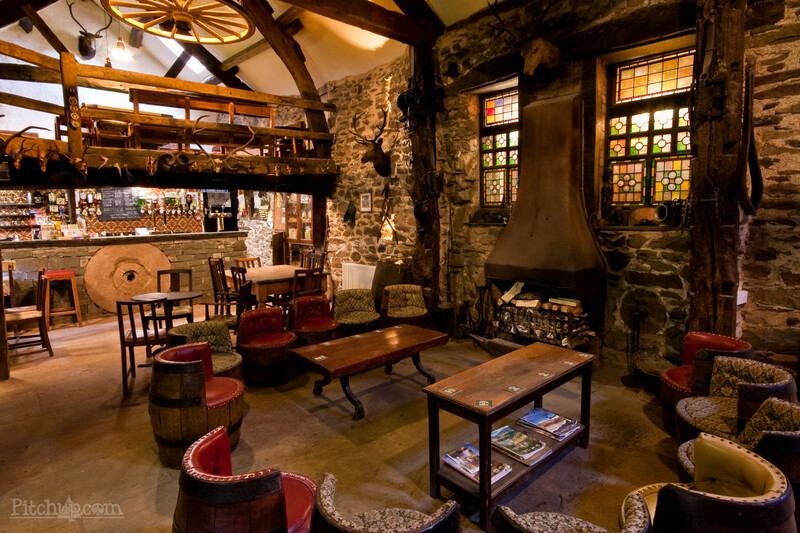 The pub is lovely with a nice fire and a mixed patronage of local and tourist, you can eat in the bar area or the restaurant, we opted for the sofa and table by the fire! I’m pretty sure I had duck sausages with mash and gravy, Lolly went for the fish pie both from the restaurant menu, both meals were delicious, the service fantastic and the atmosphere warm and inviting. With full stomachs we chipped off to bed! The wind didn’t let up that night and along with heavy rain plus the bike cover flapping about, the van again got battered, it wasn’t the best night’s sleep but we got up, showered, made some breakfast and decided to head out on an 8 mile walk to Aira Force and back, we’d already been there but the walk there and back looked pretty cool, you can download the walk we followed here. The weather wasn’t the best, it was drizzling / raining for pretty much most of the walk, on the way up to Aria force we regularly encounter fell runners braving the weather in shorts and running shoes that must have been soaked through, it’s also the first place we came across the harvesting of pine trees. These trees are no small things and require some proper machinery to cut them down and transport them away so, dotted along the walk areas that once were full of pines were now full of stumps and tractors, was a bit of shame really as it was probably a lovely path through a pine forest that’s become a path through an area that resembled a nuclear bomb going off. 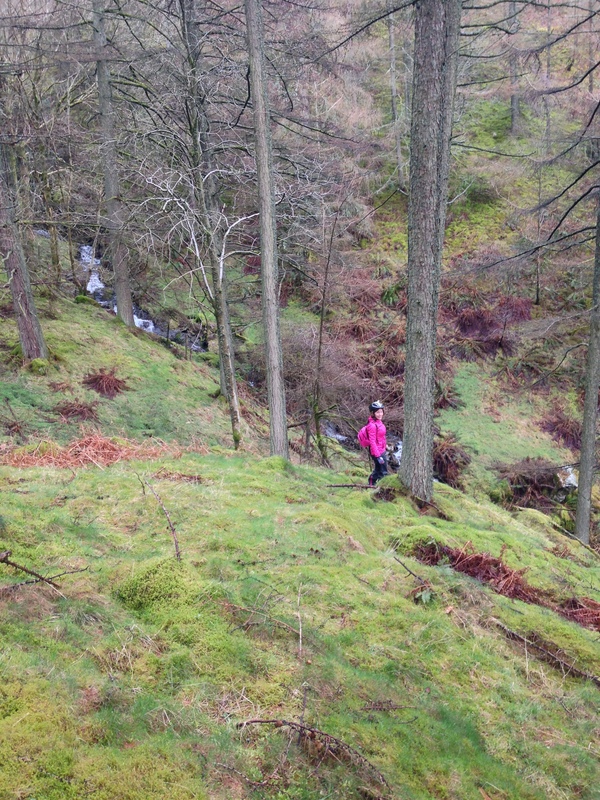 We continued up through the hills and were rewarded with some quite magnificent views of Ullswater. The first leg of the walk ended at the bottom of Aira Force with a well earned brew at the tea room, it took us about 2 hours to get there and I’m sure it was around 4 in the afternoon, the shop wasn’t serving anymore but on the basis Lolly looked like she might cry if they didn’t sell us a couple of teas they did which was very nice of them. 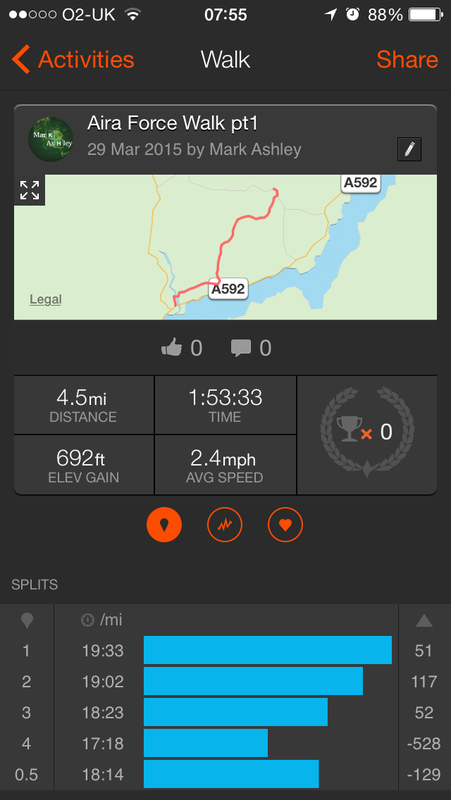 I recorded our efforts on Strava as I like statistics! After making our tea last as long as possible we eventually left the tea room as they were closing, they closed just in time for the heavens to open for our 2 hour walk back. The first part of the journey back instructs you to walk up past the waterfall which we had already seen a couple of days earlier and we weren’t going to bother instead, heading back a slightly different way, however, our way looked considerably longer so we followed the maps suggestion and were pleasantly surprised to find there is a lot more to Aira Force than we thought. 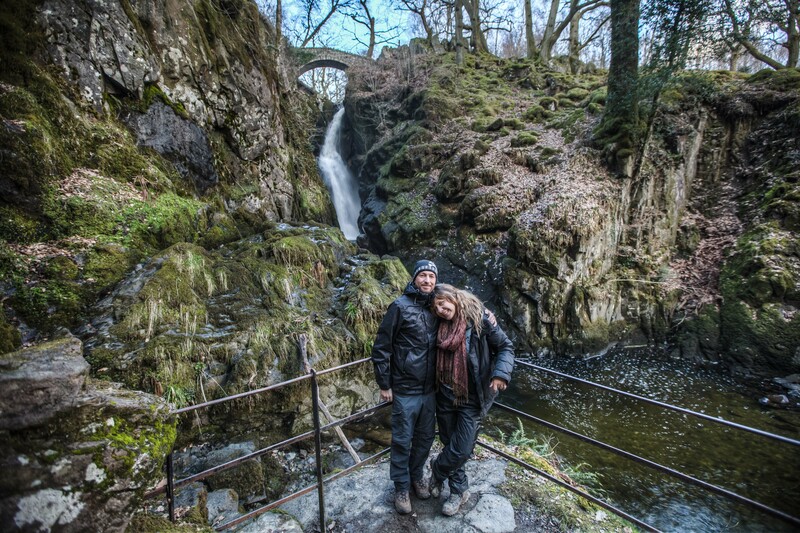 We took a picture of ourselves by Aira Force earlier and didn’t really give much thought to what was actually feeding the waterfall, it’s a really fast moving river that you can walk along the rocky banks of, there are maybe 2 or three smaller falls before the river gets to first one we saw and when it’s been raining the water cascades along with an incredible force, unfortunately it was belting down with rain so I didn’t get my camera out, must invest in a rain sleeve! As we spent quite a lot of time looking at the river we didn’t really look where we were going, to me it seemed fairly obvious we were going the right way but Lolly wasn’t convinced and insisted we re-trace our steps to a point on the map we recognised and move forward from there, despite this being the correct course of action as we only had a few hours of daylight left and getting lost would not be good, I got the arse with recovering ground and even more so when it turned out that, as I had pointed out (blindly without looking at the map) we were going the right way in the first place. The walk back seemed to take for ever and took it’s toll on Lolly, she was tired and wet and didn’t really want to do it any more, I did my very best to encourage her to keep going and we talked of finally reaching our destination and enjoying a pint of anything in front of the fire. The last hour of the walk was along roads, hilly roads I might add with not a great deal to look at, IMO it’s the worst bit of the walk as not only are you tired but it’s a bit boring. Below is Strava’s record of our efforts. Two and a bit hours after leaving Aira Force the bar had opened early and we were sat in front of the fire with my face being licked by a friendly German pointer, we had a chat with his owners and then headed off back to the van for some food, Lolly the camper kitchen fairy knocked up some amazing pasta which got polished off pretty sharpish. 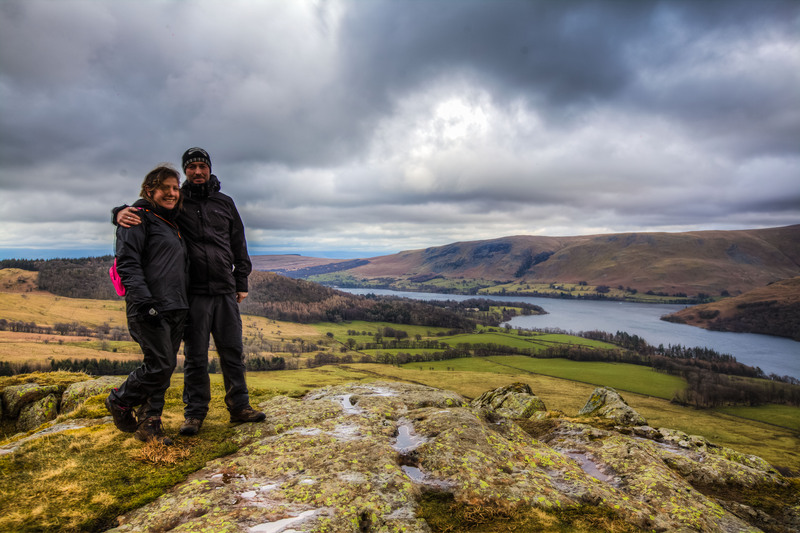 Our last adventure in the lake district would be a quick bike ride around Pooley Bridge the next day before heading off to Glentrool in Scotland for a couple of nights, we went to bed hoping for a better night’s sleep. Not suprisingly the weather didn’t let up in the evening and Lauren eventually persuaded me to take the cycle cover off which I reluctantly did, when we woke I even more reluctantly agreed that she was right, taking the cover off would mean we got a better night’s sleep, why are women/wives always right? We showered, ate, packed up and said farewell to the Quiet Site, we really enjoyed our time here and will definitely be coming back. As mentioned earlier, the plan for our last day in Ullswater was to go on a ride and take the bikes out. I had downloaded this ride and intended to do the ride on a day when we weren’t moving on, didn’t work out like that so we decided to do half the ride and then get on our way. The day before whilst walking around Aira Force we agreed we could do with one of those waterproof map holders and once parked up in Pooley Bridge we popped into the outdoor shop, an hour later, a new pair of walking shoes and map holder and we headed off in the direction Askham. 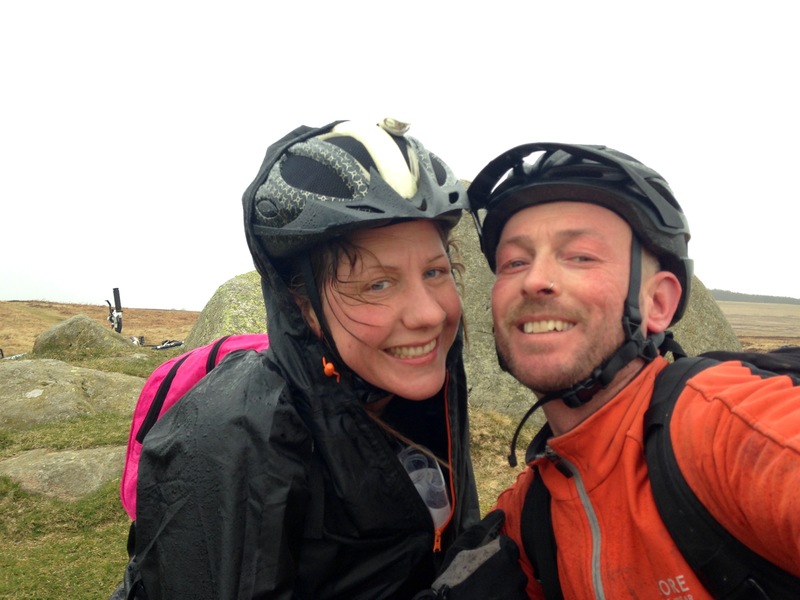 The initial part of the ride was uphill on a country road but this quickly changed to uphill and off road, it was hard work so we pushed the bikes up and rode where we could, after a short while you really could see nothing but moorland and rain, we came across a stone circle near the top of and stopped for a quick picture. From here we followed the path and made our way to the village of Askham, the journey there was pretty much downhill which made up for the never ending ascent earlier on. This should have been about the halfway point so we agreed to pop in to The Queens Head pub for a drink. As with pretty much everywhere we have been we received a warm welcome from the land lady, grabbed a drink and plotted up by the fire, we met the owners dog as well as her daughters dog who’d just been for a swim in the river. 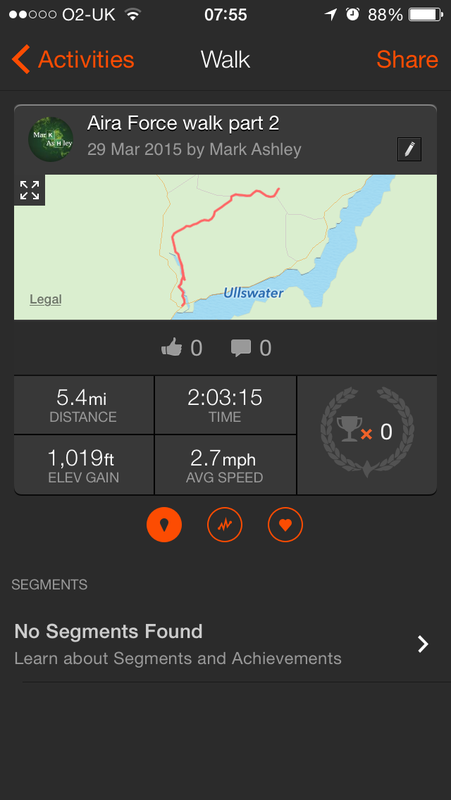 If I’m honest, I could of stayed din that pub all day but we had to get back to the van and drive on to Glentrool, we finished up, grabbed our bikes, ignored the advice of the landlady with regards to the longer but flatter route back and opted for the shorter but steeper route. The ride back was cold, wet, windy, hard work and not immediately obvious, I can safely say it wasn’t that enjoyable and because of this I don’t really have much to say about it, soaking wet we eventually got back to the van, I loaded up the bikes, Lauren made the tea, we got that down us drove to Penrith, grabbed some bits for the following day and then began our journey to Glentrool, only 2.5 hours away apparently.